Wing Chun Kung Fu is a highly aggressive art and concentrates on fighting and defending from the centerline. The most famous technique is the One Inch Punch, made famous by Bruce Lee. This is done by relaxing the punching hand, and tensing it suddenly on impact. All Wing Chun Kung Fu techniques are perfected on the wooden dummy, which consists of two arms, a mid section protraction and a leg for practicing low kicks. Sticky hands (Chi Sao), is an important feature of Wing Chun Kung Fu . Two practitioners face each other and move their wrists and forearms against each other - These exercises develop sensitivity so that the Wing Chun Kung Fu fighter can quickly anticipate his opponent's next move. Wing Chun Kung Fu is a kung fu system founded by Yim Wing Chun, who lived in Fukien with her father. Yim learnt kung fu from Ng Mui, a nun of the Shaolin Temple. Yim observed a snake fighting a crane, and together with Ng, created a new kung fu style consisting of three forms that became known as Siu Nim Tau (Little Idea), Chum Kiu (Seeking Bridges) and Biu Jee (Darting Fingers). Ng suggested that the style be named Wing Chun Kung Fu . Yim taught Wing Chun Kung Fu to her husband, Leung Bo Zhou, who incorporated the 6 1/2 feet pole or staff set to the system. Wing Chun Kung Fu did not gain widespread popularity until in recent times. The master who did the most to spread Wing Chun Kung Fu was Yip Man. Originally from Foshan, Yip fled to Hong Kong in the turmoil of communist takeover of China and set up schools in Hong Kong to teach Wing Chun Kung Fu . His pupils include Bruce Lee. Our eBook contains an illustrated guide to the Siu Nim Tau Form, together with detailed notes setting out key concepts, drills and applications. 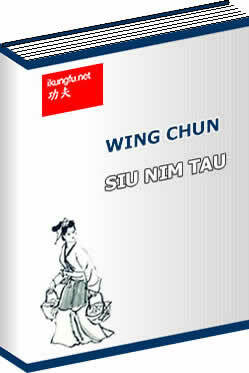 Siu Nim Tau means “Little Idea” in Chinese, and is the entry-level set of Wing Chun Kung Fu . The name reminds the beginner to think small and not be overtly ambitious. The form introduces the practitioner to the basic Wing Chun Kung Fu principles such as centre-line fighting, straight line punches and the basic stance of the style. Whilst it may appear easy to pick up, Siu Nim Tau is actually quite difficult to master. Its techniques lie at the center of all combat in Wing Chun Kung Fu . Understand the key combat principles of Wing Chun Kung Fu with our illustrated guide on the Centerline Principle, The Straight Line Principle, and Inner and Outer Doors and Four Gates Theory. Form the stance properly with our illustrated guide on how to form the basic stance of Wing Chun Kung Fu , the Kim Yeung Stance. Develop your punching technique with our guide on the Centerline Punch, the most important punch in Wing Chun Kung Fu . Learn about the transitions of the fist after the Centerline Punch with our guide to the Huen Sau, the circling hand. The illustrations for the form itself comprise of over 125 carefully created color diagrams in addition to the many illustrations in the main body of the eBook. Our eBooks contain detailed instructions written by our expert editors in a friendly, easy to read style. All text is in English. Multiple angles of the technique are covered in the diagrams where applicable so that you can see the technique from all perspectives. We provide two formats of our eBook for each customer: an HTML version and a PDF version. The HTML version is compatible with Windows PC, Apple Mac, iPhone, iPad as well as Android phone / tablets. The PDF version can be accessed from any device running Adobe Reader. The PDF version of the eBook can be printed from any printer. Click on the "BUY NOW" icon above. After payment is processed, click "Continue" on the Payment Completion page to download your eBook immediately. We are very confident that our product will work to your complete satisfaction. However, if you are unable to download or use it on your PC, we will be happy to refund your money. "Learning kung-fu is so much easier with your ebooks! "I enjoyed your first Drunken eBook, and bought the remaining set as well!" "My friend recommended your website to me. Your ebooks are good value for money!"